Back in 2014, I sent a link to my mechanic, Honda Bob, to a product that I thought was a joke. 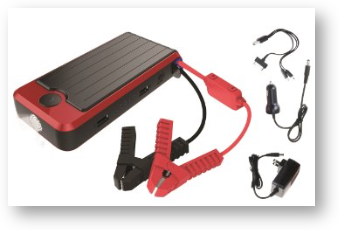 It was a small, portable battery that supposedly you could use to jump start your car. Like I said, I assumed it was a joke, but he immediately bought one to test it out. He reported back with a blog post about how it actually worked! The device is called the PowerAll Power Bank, and it comes in two sizes, 16,000mAh and 12,000mAh. After Honda Bob’s vote of approval, I bought one for each of our cars, and for each of our kids cars. You might be asking yourself why I’m telling you about this again if you’ve already heard about it in 2014. Last week Steve and I wanted to go for a bike ride and he got out his portable compressor to fill our tires. It plugs into the 12V auxiliary power in a car (what we used to call the cigarette lighter port when smoking was a thing.) So the compressor draws juice from the car’s battery. Once Steve was on a roll filling our bike tires, he decided to fill the tires on both cars too. You can already see where this is going, right? Sure enough, he drained the battery on the car. We have jumper cables of course, and my car was right there, but I suggested we see for ourselves whether this little battery charger could actually jump start a car. I’ve jump started a car before but it’s a little bit terrifying. You’ve got one car running, you’ve got these cable clamps that if you get switched or touch each other will short out and destroy the car or even kill you, so it’s intimidating. With the Powerall Power Bank, you’ve got the brick of a battery (think of something maybe half again as big of a battery as you’d use to charge your phone a couple of times and these adorable little cables coming out of it with two little clamps. The cool thing is that the cables are different lengths, so even if you did drop the cables, one cannot touch the other. You’d have to actively touch them together. We looked at the instructions that came in the little cardboard box and put the clamps on the battery terminals as instructed, turned on the battery and Steve started the car. Easy peasy, worked perfectly. A key piece of the success of this story is that I keep the Powerall plugged into power in the center console of my car so that it’s always charged and ready. If I didn’t, it wouldn’t be much use in an emergency, would it? The Powerall also has two USB ports on it so I often let people use it to charge their phones. It’s got an emergency light that blinks too which could be good if you’re on a dark road an need to catch someone’s attention. It comes with a wall charger, and tips for every single type of phone ever made too. The box for the PowerAll is much smaller than carrying around giant jumper cables, so I’d never go back now that I know it works. The 16,000mAH version is $85 on Amazon, while the 12,000mAH PowerAll is only $60. I bought the smaller battery version, and it jump started Steve’s Acura RDX, which is a smaller SUV just fine. If you’ve got a much larger vehicle, like a giant Cadillac Escalade, you might need the bigger one. Anyway, link in the shownotes to the PowerAll Power Bank on Amazon. Note for blog readers – the image link to the PowerAll is showing $89.90 right now for the 16,000mAh version but if you click through it really is $85. This is cool. I’m going to get this for the hubby.